Welcome Home! Complete with many updates, this incredible home is located in Foxberry Run, the jewel of Ridgemoor, in the heart of East Lake. It is beautifully landscaped and boasts an executive style layout with 4 bedrooms, Office(could be 5th bedroom) & 3 1/2 baths. This triple split plan design has soaring ceilings and room to roam. Your Double front doors lead immediately to your WOW as it looks out over the resort worthy pool area. Once inside, comfort is the key in this home with open spaces that offer a wonderful mix of ideal areas for gathering as well as personal space. The Master Bedroom is masterful with over 600 sq.ft with walk-in closets and an entry into the office. Large family events flow easily from formal to informal areas featuring vaulted ceilings, a wet bar and gas burning fireplace. The wide open kitchen, with it’s many updates, overlooks the family room and pool area. Your transition outside is highlighted by the large pocketing glass sliders drawing you to the large screened in pool area which impresses immediately with its french pattern laid travertine and pebbled waterfall that pours into the spillover spa. The more than generous covered lanai is complete with its own outdoor kitchen. Recent updates include: Kitchen Cabinets & granite and the bathrooms (2015/2016), Travertine pool deck (2014), Exterior Paint (2014), Resurfaced Pebble tech pool (2014), HVAC (2010/2013), Water Heater (2014). Don’t miss this opportunity…This is one you really need to see for yourself. Welcome Home! 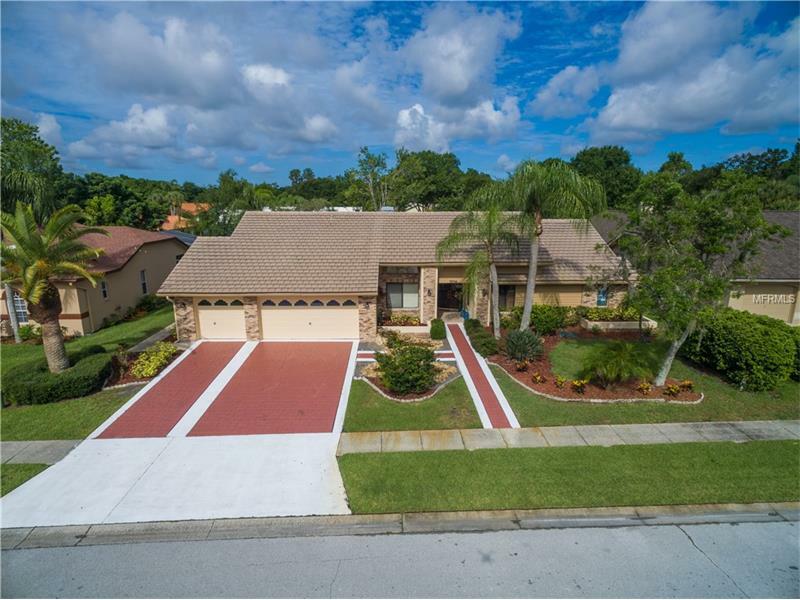 Fantastic East Lake pool home in Ridgemoor! Open and bright, this 5 Bedroom/3 Bathroom/3200 sq/ft home has room to roam both inside and out! Soaring 21 foot ceilings in the entry way give way to french doors leading into the formal living and dining rooms. The Updated kitchen opens to the family room and overlooks a spacious backyard and oversized pool complete with waterfall. That’s not all…Private and tucked away, the “5th bedroom” is on the main floor and can be used as an office or as an “in-law suite”. Upstairs, the massive master suite (almost 400 sq/ft) opens out to a balcony over-looking the pool as well as the entire neighborhood! The opposite side of the second level is home to 3 additional spacious bedrooms! Oakridge Estates at Ridgemoor offers easy access to Tampa, famous beaches, great shopping, and restaurants. Ridgemoor amenities include basketball, tennis and playground. Only 1 ½ miles away from John Chestnut Park with boat ramp, dog park, trails, picnic areas, playgrounds. Rarely will you ever need to venture out of East Lake! Begin your Paradise Life today!